In the stand mixer, mix the butter until it's creamed. Add in the sugar and powdered freeze dried strawberries. I added an .8 oz package of freeze dried strawberries into a food chopper and let it go until everything was a powdered. Mix on medium just until the butter and sugar come together. (The more the sugar and butter is creamed the fluffier the cookie will be.) Scrape down the sides. Add the egg and vanilla. Turn the mixer on medium and mix until the egg is completely incorporated. Lastly, add all the flour. You can either put a towel over your mixer until everything is incorporated or start out on the stirring setting of the mixer until the flour started to incorporated. Once the flour is mixed in some, go ahead and turn the mixer on medium and let it mix until the flour is combined with the creamed mixture. Roll dough between two pieces of parchment paper. Place in the fridge for 2 hours or until the dough is firm. I left mine in overnight. You can also cut the cookies out and place them into the freezer for 1 hour before baking. Whichever method you prefer, will work. Just remember to separate the cookies with parchment paper so they don't stick together. 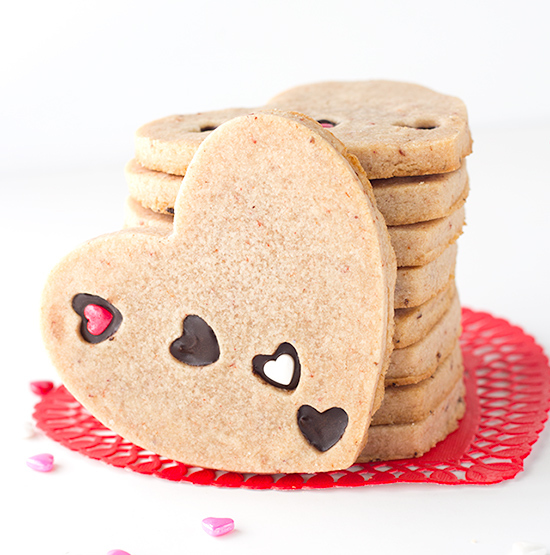 Take the top piece of parchment paper off and cut the cookies with preferred cutters. I used a 3 inch heart cutter and used a small veggie cutter the shape of a heart for the tiny hearts. Place 6 cookies on a baking sheet lined with parchment paper. Don't let the dough get warm otherwise your cookies may spread. Bake the cookies for 9 minutes or until the edges become golden brown. Remove them from the oven and let them cool. Melt the milk chocolate candy melts in a glass microwave-safe bowl. Microwave in 30 second intervals and stir after each time until smooth. Add the chocolate in a sandwich bag or piping bag. Pipe in the little hearts with chocolate while the candy is still sitting on the parchment paper. You can also sit them on wax paper to fill with chocolate. Add a heart sprinkle and let the chocolate dry completely. 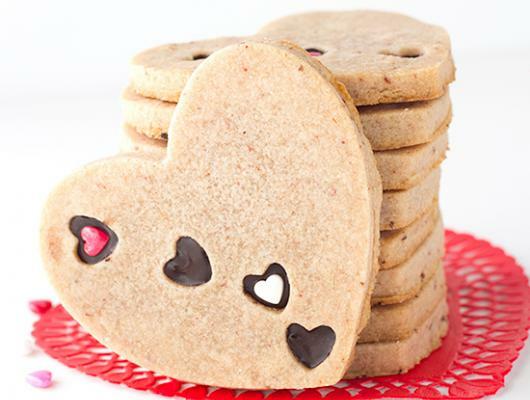 Strawberry Sugar Cookies - Delicious cut-out strawberry flavored sugar cookies with little heart cut outs that are filled with milk chocolate. The perfect Valentine's Day treat!